The RCRC-6R is a remote control receiver designed to provide a quick and cost effective solution for a variety of wireless applications. The receiver includes an external antenna, decoder and six 10A SPDT relays. The relays are individually configurable for Momentary, Toggled, or Latched operation. The receiver offers excellent sensitivity and selectivity by its utilization of SAW technology and state–of-the-art low noise amplifiers. An external jack is provided for an external long-range antenna. Applied Wireless’ proprietary C-Code protocol provides a very high degree of security, with more than 16 million transmitter ID codes. 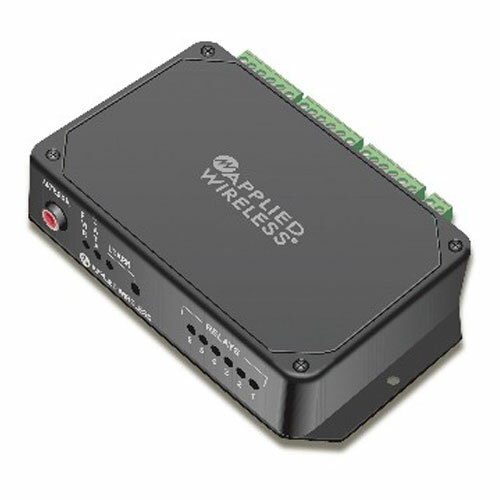 Units are designed to work with Applied Wireless KTXW C-Series handheld remote control transmitters. This is a learning receiver, and can learn up to 4 different factory-coded transmitters. Alternatively, a single “house” address code can be used for applications needing many transmitters operating one receiver. *When used with DP dipole antenna. Typical range is 300-400 ft. when used with standard non-ground-plane whip antenna (included) Other antennas available as well.